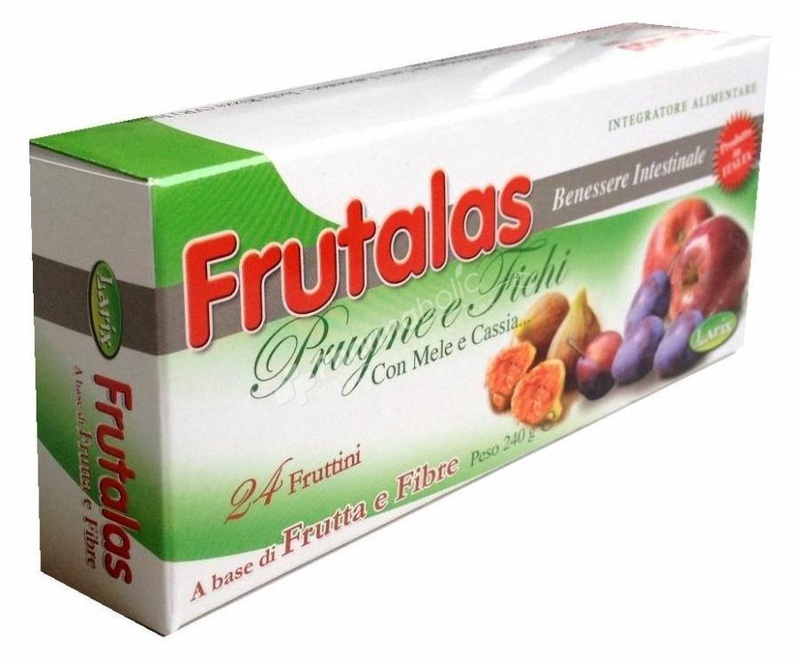 Frutalas Prunes and Figs rich in fruit and fiber, Useful for the lazy bowel and contains Lactobacillus acidophilus to promote the proliferation and the balance of the bacterial flora. Product rich in fruit and fiber, for a physiological intestinal transit. Plums, figs, apples and Cassia to combat constipation . Frutalas is a dietary supplement without gluten, coloring agents and preservatives, produced in Italy by the company Larix to help the 'gut to maintain its natural balance. Cassia, an herb very useful to unlock the intestinal constipation. Just chew a single Frutalas in the evening before bedtime, accompanied by a glass of water, to find the "longed regularity"! Useful for the lazy bowel and contains Lactobacillus acidophilus to promote the proliferation and the balance of the bacterial flora. With lacto bacillus Acidophilus that promotes the growth and balance of the bacterial flora. Daily Intake - 1 tab in the evening before sleeping with plenty of fluid. Dehydrated apples ( malus domestica borkh.,) fruit, 34.6%, lactose, manna (Fraxinus Ornus) 6%, Apple (Malus domestica borkh., fruit) pure juice 6%, Dehydrated Prunes (Prunus domestica., fruit) 5%, Vegetal Glycerin, Fig(Ficus carica L.) pure flesh 3%, apple fibre 3%, Dried Yoghurt.